How is the ‘Our Future’ visioning process structured? ‘Our Future’ started with the Community Survey, which examines the issues that are shaping the future of Hilton Head Island. This survey runs concurrently with other phases of the visioning process, including in-person engagement. The first in-person engagement was a Think Tank, in which four plausible scenarios for Hilton Head Island were developed. These scenarios have been introduced to the wider community in 20-30 Engagement Workshops in August and October. In December, a number of focus groups will be held with key sectors across the Island and the Think Tank will reconvene. This will enable the identification of areas of shared vision for Hilton Head Island. 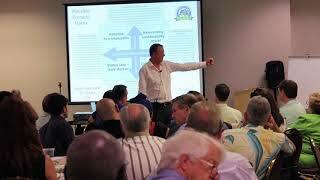 Finally, action steps will be identified for the future of Hilton Head Island. 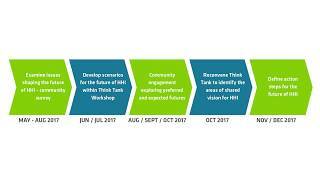 How do the Engagement Workshops in August and October connect to the Think Tank and Community Survey? The Community Survey, which is still running, asks local stakeholders for their input and opinions on a range of issues impacting the island that were identified through research and interviews. Citizens are also encouraged to give their views through a range of open-ended questions. The Think Tank highlighted some of the results from the Community Survey and produced the plausible scenarios through in-depth scenario planning with 150 island stakeholders. The Engagement Workshops connected to the Community Survey and Think Tank, as they brought the scenarios out into the wider community for consideration. This enables all sections of the Hilton Head Island community to discuss how it could look in the future, under each of the scenarios. How were people selected for the Think Tank workshop? The Think Tank workshop was conducted on June 23, 2017, and involved 150 invited stakeholders who would represent a cross-section of the island. Participants included various representatives from organizations, institutions, age groups and locations all over the island. There was also an open application process announced online and within the local media inviting people to apply to attend the Think Tank. All applicants were invited to attend. I wasn’t at the Think Tank. Why should I be part of the Engagement Workshops? Your input is critical to the overall ‘Our Future’ visioning process. The Think Tank created the four broad plausible scenarios which are discussed in some detail during the Engagement Workshops. We are asking you to react to these scenarios and the underlying key issues. In particular the Engagement Workshops helped us to explore implications and appetite for change. We need you to tell us where you think Hilton Head Island needs to be in 2040. The process needs your input! How will my input be used from the Engagement Workshops? The exit surveys from the Engagement Workshops will be collected and analyzed. Your input in these paper surveys will contribute to the overall results and action steps of the visioning process. How can I see the input that is being collected and what is the Data Visualization Platform? The Data Visualization Platform will enable citizens from across the island to look at stakeholder views on the preferred and expected futures from the scenarios, and filter the data by gender, age, geography and demographics. You will also be able to explore the responses to a range of key sensitivity-based questions, and explore the type and size of change people want. This Platform will be accessible through this portal. What are the intended outcomes from the ‘Our Future’ visioning process?